A partner agency is our umbrella term for nonprofits such as food pantries, soup kitchens, homeless shelters, senior centers, and other organizations that provide emergency food assistance to people in need. These agencies are on the front lines of hunger, directly providing food and other human services to their community. Across our 34 county service area, we work with over 800 partner agencies. These agencies are typically volunteer-run, community-based, and under-funded. Some are only open one day per month, others on a regular basis. Their sizes and services range from a food pantry in a church that provides groceries to the neighborhood, to a community center that offers a variety of resources such as affordable housing assistance, nutrition education, and programs for children. Monday through Friday, our branches are filled with volunteers from these agencies who come to the Food Bank to pick out the food they will use to stock their shelves. Our trucks deliver food to our smaller or rural agencies who don’t have the ability to pick up food from one of our branch locations. As the Food Bank, we work full-time to build partnerships with our donors such as retailers, companies, and individuals to raise money and food year-round. We act as a large-scale resource not only for fundraising purposes, but also as a source of knowledge of providing hunger relief such as how to successfully run a food pantry, how to provide nutrition education to kids, and how to make the biggest impact in their community. We also regularly monitor all agencies for proper food storage, handling, and distribution. As we mentioned before, many of these agencies are volunteer-run and simply do not have the resources or person power to collect enough food and funds to provide to their clients on a regular basis. Our partner agencies are crucial to the work we do and our ability to carry out our mission. They are the key to getting food to people who truly need it, and we are so grateful for their hard work and leadership across our service area. Thank y’all so much for your service to the community! 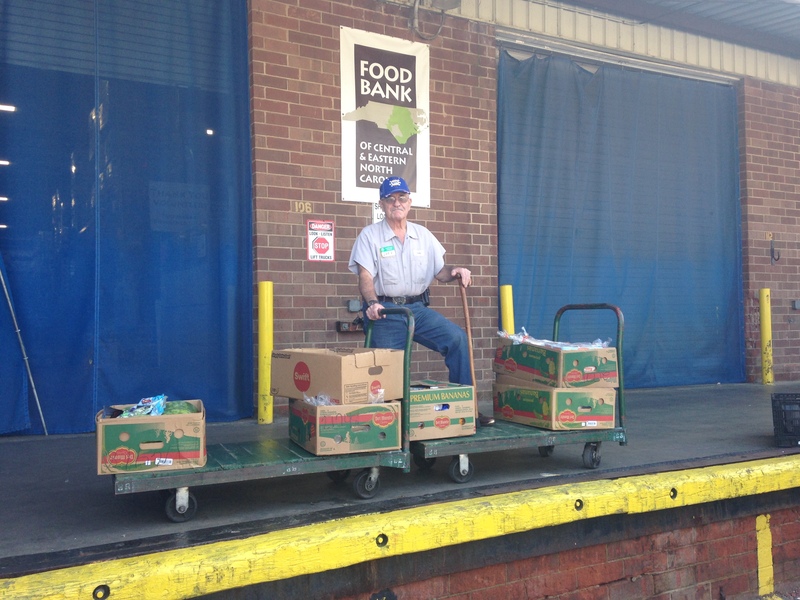 A volunteer from a food pantry comes to our Raleigh Branch to pick up fresh produce and bread. Interested in becoming one of our Partner Agencies? Learn more about the Requirements for Partnership here. CSO-Caring Sisters Outreach would like to become a partner agency. We give out nonperishable food and hygiene products to anyone in need. We also provide resources for the elderly. We are on Facebook and our number is 252-414-0428. Thank you. Hi there, look over this page to see the requirements and application for becoming a partner agency of the Food Bank: http://www.foodbankcenc.org/site/PageServer?pagename=getinvolved_partner Thank you for all the good work you are doing in your community.